Mustapha Kanit Wins the €50,000 Super High Roller for €936,500! Welcome to the big time, Mustapha Kanit. You've done it. The €50,000 Super High Roller at the 2015 PokerStars and Monte-Carlo® Casino EPT Grand Final was a fast-paced, action-packed affair that took just one day to finish. Kicking off shortly after 12:30 p.m. local time on Sunday, the final hand was dealt just before 3:30 a.m. Monday morning. When registration closed, 66 entries and a prize pool of over €3.2 million were tallied. The top prize was worth €936,500, and it would be the Italian walking away with the title. Entering this event, Kanit boasted live tournament earnings of nearly $2.7 million, and he's now scored the largest payday of his young career. Previously, Kanit's largest result came in early 2014 when he took fourth in the PokerStars Caribbean Adventure $25,500 High Roller for $492,600. The top nine finishers were set to cash, and when the final 10 remained, it was a fighting battle for the short stacks to stay alive. Eventually, Vladimir Troyanovskiy was eliminated in 10th place to serve as this event's "bubble boy." Scott Seiver had once again reached the money of a super high roller event, but his run ended in ninth place. He was foliowed to the payout desk by Ivan Luca, Mark Teltscher, Andrei Streltsou, and then a trio of Germans — Fabian Quoss, Fedor Holz, and Martin Finger. The last man standing in Kanit's path to the trophy was Mike Watson, and extremely formidable opponent. Quickly into the match, Kanit doubled against Watson and took the chip lead. From there, there was one small bump in the road for Kanit, which came in terms of a double for Watson when he fell super short, but that was it. Kanit's jovial aggression, backed by the support of his boisterous rail, helped him finish the job. On the final hand, Kanit's dominated Watson's . 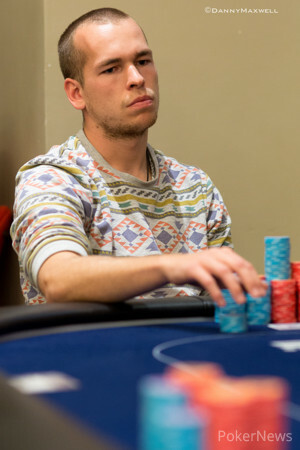 The young pro known as "lasagnaaammm" on PokerStars flopped trips and won from there, holding through the board. 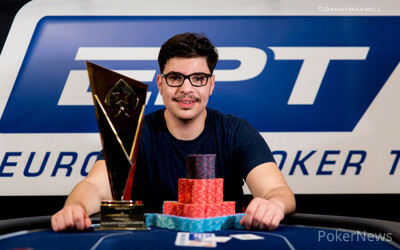 For his runner-up finish, Watson took home €672,300, but all eyes were on the champion, Mustapha Kanit. Mike Watson was crippled and only had about a million left, but doubled up not long after. Kanit moved all in and while Watson tanked for a bit, Kanit was already celebrating; "The Champion!" Kanit laughed, "This is the hand! I take the picture like this!" he continued while holding his two cards in the air, not showing them to Watson just yet. Watson wasn't impressed and called. Kanit showed and Watson tabled . Kanit seemed confident he would hit, and he did, but he wouldn't win the tournament just yet: . "He called him with jack-high!" Dan Smith yelled from Watson's rail. Watson doubled up to ten big blinds, but would hand those chips over three hands later. Watson shoved from his button and Mustapha Kanit made the call. Watson was dominated, but a split pot wasn't out of the question with these hands. After the flop, that was nearly impossible: . A split pot wasn't in the realm of possibilities anymore after the hit the turn, but Kanit wasn't home safe just yet as a four could still spoil his party. The dealer didn't make much of a show out of it fortunately, and the on the river was dealt straight away. Kanit shook hands with Watson, and then celebrated with his rail. Mustapha Kanit raised on the button, and Mike Watson called from the big blind to see the flop come down . Watson checked, and Kanit checked behind. The turn was the , and Watson bet 500,000. Kanit raised to 1.275 million, and Watson called. The river was the to complete the board, and Watson checked. Kanit paused, then announced a bet of 3 million. Watson called. Kanit quickly turned over the for a straight, getting there on the river, and Watson mucked his hand before sending the chips over. Mustapha Kanit made it 450,000 to go and Mike Watson shoved all in over the top. Kanit instantly called all in for 3,560,000 holding , Watson tabled . The flop came and that just about settled it. The gave Watson some suckout possibilities, but the wasn't one of the cards he was looking for. Double up for Kanit! Martin Finger shoved all in from the small blind and big blind Mustapha Kanit instantly called. The board ran out and Kanit eliminated his German opponent. 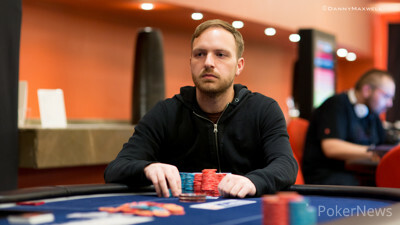 Kanit and Finger are guaranteed €672,300, and play heads up for the €936,500 first place prize. No deal talk as of yet. Mike Watson limped in from the small blind and Martin Finger bumped it up to 460,000 from the big blind. Mike Watson made the call. Watson checked on and Finger bet 410,000. Watson called. Watson check called another 1 million on the turn, and checked again on the river. Finger tanked for a bit before betting 2,080,000. Watson immediately called. Finger showed , Watson tabled and left Finger crippled. Fedor Holz shoved his stack worth a little over 1 million in chips to the middle from first position. Finger and Kanit threw their cards in the muck rather rapidly, but Mike Watson in the big blind was interested. He thought for just a few seconds before calling. Holz was ahead with the as his opponent turned over . The flop was disastrous for Holz though, and he was drawing dead by the time the hit the turn. Holz got up from the table while the dealer burned and put the on the river to make things official. Holz shook hands with his three former opponents and headed to the pay out to collect his cheque wort €329,800, just slightly less than the €337,500 he made for his 7th place in the €100,000 Super High Roller last night. No titles and trophy's just yet here in Monaco, but not too bad a start to the festival for the young German. 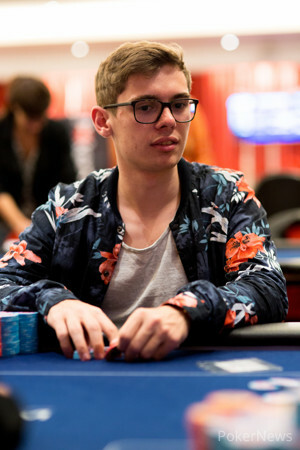 Fedor Holz moved all in from the button for around 2.5 million. Mustapha Kanit called from the big blind with the . Holz had the . The board ran out , and Kanit doubled up. He was all in for 1.345 million. Alvarado Runs Into a Better "50K Specialist"
Rapid Reaction: Is Erik Seidel the G.O.A.T.? Time For Something New, Time For Something Fast!